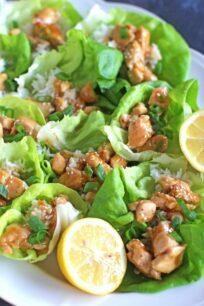 Honey Lemon Chicken Lettuce Wraps are such a great appetizer, snack or the perfect healthier dinner. Full of flavor and light, ready in 30 minutes. 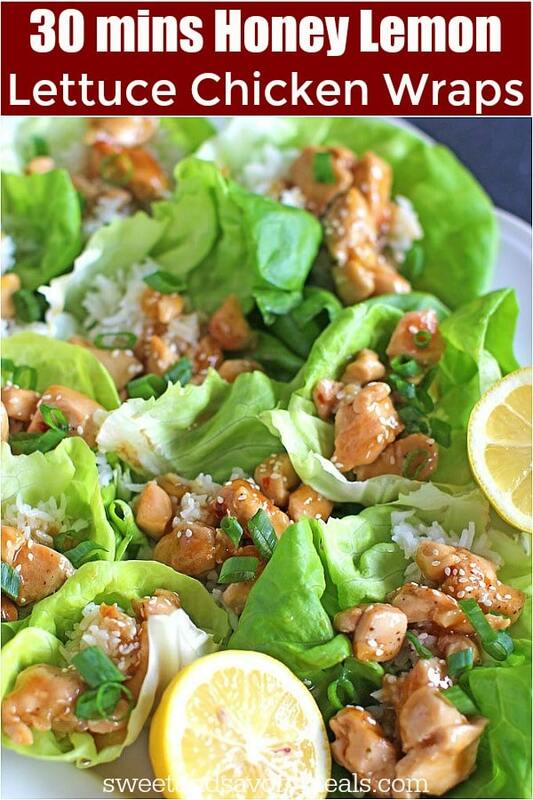 Honey Lemon Chicken Lettuce Wraps are my new obsession! These little guys are so full of flavor, sweet from the natural honey, with a gorgeous lemon aroma from the fresh squeezed lemon juice and lemon zest. Served over white or brown rice on top of butter lettuce leaves taco-style, these can be passed as a delicious appetizer or light and protein packed snack. 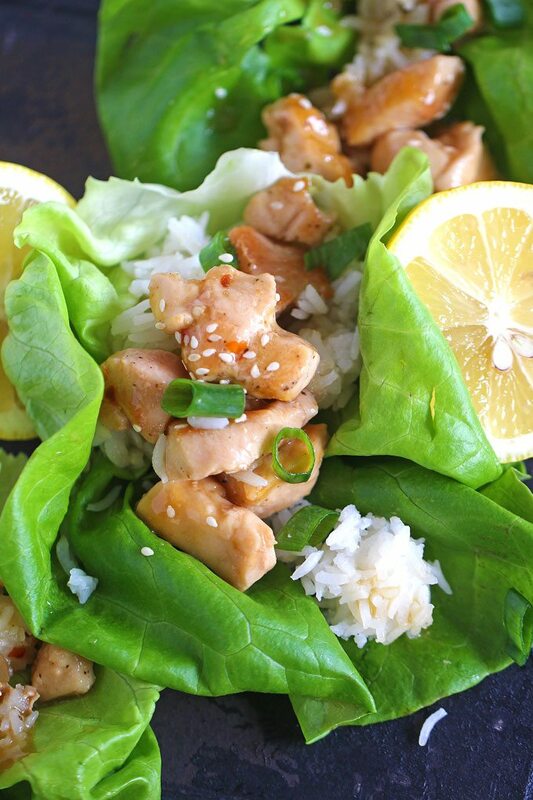 The Honey Lemon Chicken Lettuce Wraps have a very refreshing taste, they will easily brighten a dinner table and also can be made in advance and assembled in minutes right before serving. 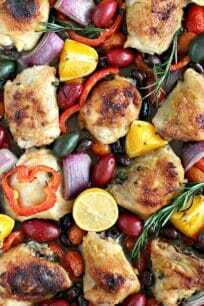 Make a large plate and serve them for dinner, as it will take you only 30 minutes to make these! 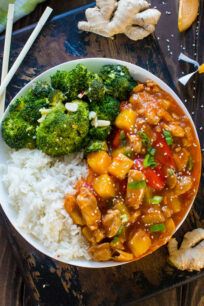 Instant Pot Orange Chicken – OMG the flavors are amazing! Chicken Pesto Kebabs – on the grill or in the oven! Creamy Parmesan Mushroom Chicken – the epitome of comfort food! In a medium saucepan add rice and 1½ cups water, cook rice according to package instructions; set aside when ready. In the meantime, heat olive oil in a large skillet over medium high heat. Season chicken with salt and pepper add it to the skillet, cook until golden, stirring and tossing occasionally, about 3-4 minutes. Remove skillet from heat and set aside. Add chicken broth, orange juice, lemon juice, lemon zest, honey, soy sauce, vinegar, ginger, garlic and cornstarch to a medium sauce pan over medium heat, stir to combine. Bring to a boil, reduce heat and simmer until slightly thickened, stirring from time to time, about 4-5 minutes. Once the sauce has thickened, pour it over the chicken. Cook on medium low heat for 1-2 minutes, stirring and gently tossing to combine. Remove from heat and set aside until ready to serve. To serve, spoon 2 tablespoons of rice into the center of a cleaned lettuce leaf, top with honey lemon chicken, drizzle with a little more honey lemon glaze. If desired, garnish with sesame seeds and chopped green onion. 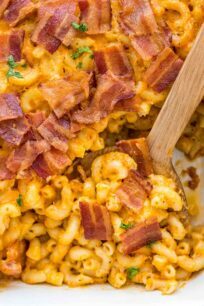 Love this for a low carb lunch option! They sound delicious! I love lettuce wraps! So much flavor happening here! 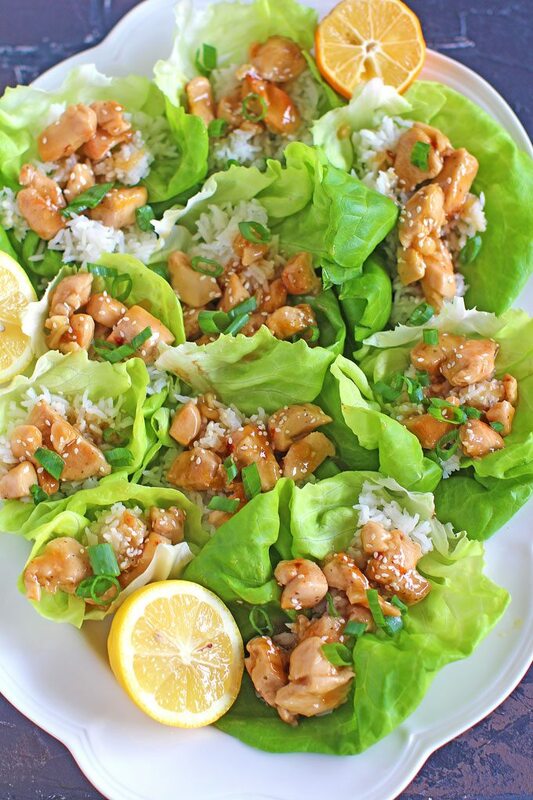 Lemon and honey in lettuce wraps with chicken?!? Oh, heck yes! I’m totally into these! Loving these for an easy dinner or lunch! Gorgeous! I love how these wraps are so versatile and can be made ahead of time. The photos of these are gorgeous! I’m craving lemon this spring! This would be the perfect lunch!